In order to make your special event complete, our marquee hire company also provides an assortment of draping and décor hire services in Durban at reasonable prices. As professional lighting and décor specialists we will tailor your event to suit to your tastes and give your guests something to truly remember. By using our services you can be sure of an attractive, warm and pleasurable ambience for your party. A wedding cannot be complete without a wedding arch. Our simple and elegant arches will provide a romantic backdrop on your big day. From traditional floral designs to something more contemporary, with have the right arch to match the feel of your wedding. 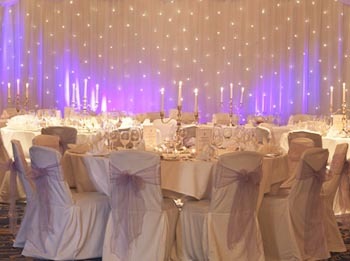 Our lighting specialists are always ready to give your function a unique ambience by installing lights that match with the theme of the event. Our team of lighting experts will deliver and install the lighting and advice you on the correct amount required for your function. If you need a dance floor at your occasion, we will gladly provide you with one. Our experts will deliver it promptly and assemble it at the required location. Make your function memorable with our quality linen and décor for hire in Durban. Simply call us on 031 100 1905 and request a quote. We are always available all day long. Besides, you can get in touch with us for gazebo hire services for any event.